Turn on any national news program or open a newspaper and these headlines are likely similar to the ones that you have heard. This summer, the U.S. public has been hearing about a massive influx of unaccompanied minors from Central America. It is estimated that up to 90,000 children will arrive by September. Why the “sudden” influx? Has this happened before? What’s the difference between a migrant and a refugee? In the mainstream media coverage of this humanitarian emergency, the right questions aren’t even being asked, let alone answered. 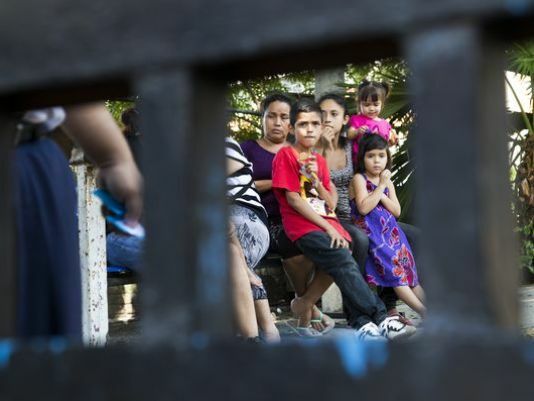 Few media stories look at the root causes of the poverty and violence that are pushing children out of Central America and toward our borders, including the large role past and present U.S. policies have played. But the media is not the only source of mis-information. 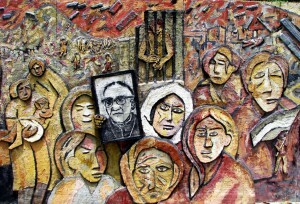 Our schools have long ignored Central American history. Thirty years ago, the Council on Interracial Books for Children (CIBC) published a critical review of the representation of Central America in U.S. textbooks. Their decades old assessment still holds true today. “Name recognition is generally the only knowledge that most people in the U.S. have about Central America,” the CIBC wrote, explaining that this lack of information is aided by the media, which rarely covers Central America, except in times of emergency. Textbooks, if they mention the region at all, exclude any mention of the United States’ and other world powers’ involvement in the region’s governments, agricultural systems, and trade policies. Thus, the causes of Central America’s “underdeveloped” status and high rates of poverty are reduced to poor climate and the shortcomings of its people, rather than products of global economic and political systems, originating from centuries of colonization. Teaching for Change offers resources to fill this gap with our “Putting Central America On The Map in Schools” campaign. There are free downloadable lessons, poetry, biographies, and lists of recommended books and films to ensure that students are informed about the context of this current crisis and Central America history and culture in general. We also share here one of the best articles we have come across on the media misinformation about the recent influx of immigrants, “Debunking 8 Myths About Why Central American Children Are Migrating” by David Bacon from In These Times. This reality check is needed to challenge the mainstream media portrayal of the U.S. as the “victim” and instead to have the information we need to find real solutions based on the root causes of this humanitarian crisis. ‘Lax enforcement’ is not the culprit—U.S. trade and immigration policies are. 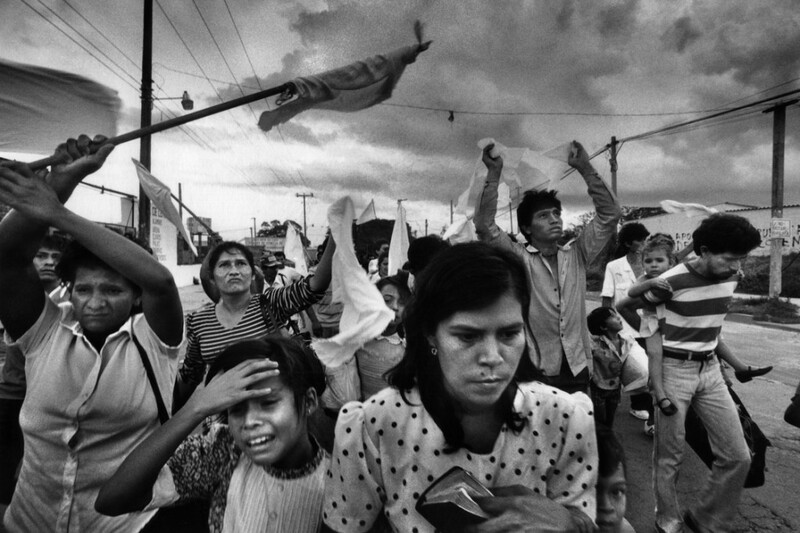 In November 1989, civilians in a zone held by insurgents flee their working-class barrio after three days of aerial bombing by the Salvadoran air force in Soyapango, El Salvador. Photo by Donna DeCesare. All of this ignores the real reasons families take the desperate measure of leaving home and trying to cross the border. Media coverage focuses on gang violence in Central America, as though it was spontaneous and unrelated to a history of U.S.-promoted wars and a policy of mass deportations. Yesenia remembers hiding from soldiers during the war. 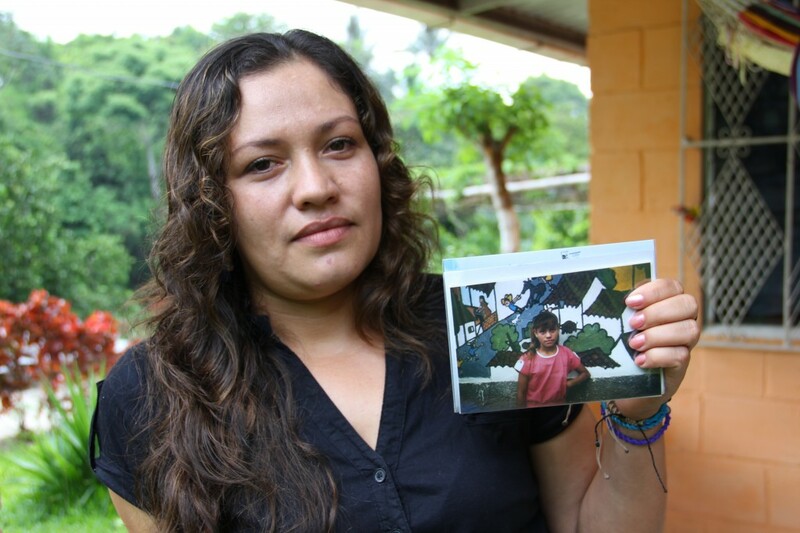 Now she is raising her son in El Salvador on her own while her husband works in the U.S. Photo by Pat Goudvis. 1. There is no “lax enforcement” on the U.S./Mexico border. There are over 20,000 Border Patrol Agents; that number was as low as 9,800 in 2001. We have walls and a system of large, centralized detention centers that didn’t exist just 15 years ago. Now more than 350,000 people spend some time in an immigrant detention center every year. The U.S. spends more on immigration enforcement than all other enforcement activities of the federal government combined, including the FBI, the Drug Enforcement Administration and the Bureau of Alcohol, Tobacco, Firearms and Explosives. The growing numbers of people in detention—young people as well as families and adults— is being used as a pretext by the anti-immigrant lobby in Washington, including the Tea Party and the Border Patrol itself, for demanding increases in the budget for enforcement. The Obama administration has given way before this pressure. 2. The migration of children and families didn’t just start recently. 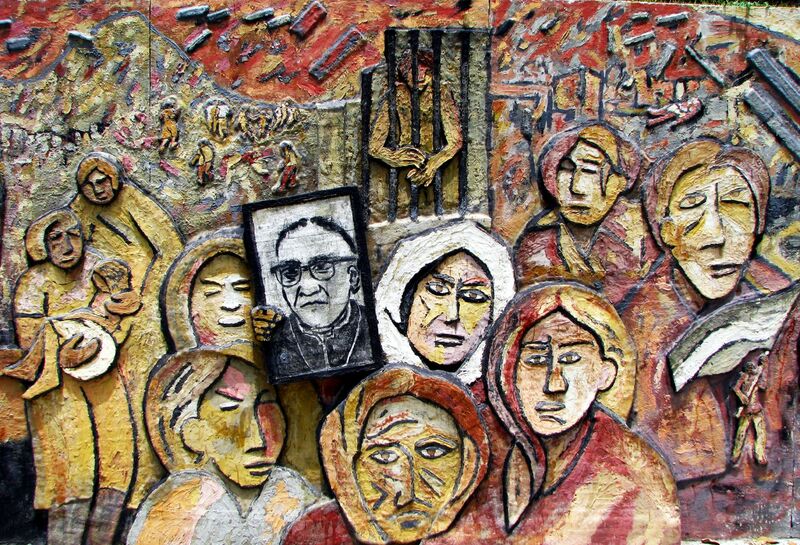 Archbishop Romero was killed in 1980 after he spoke out against U.S. support of the Salvadoran military. It has been going on for a long time, although the numbers have recently surged. The tide of migration from Central America goes back to wars that the U.S. promoted in the 1980s, in which we armed the forces, governments or contras, who were most opposed to progressive social change. Many hundreds of thousands of Salvadorans came to the U.S. during the late 1970s and 80s, to say nothing of Guatemalans and Nicaraguans. Whole families migrated, but so did parts of families, leaving loved ones behind with the hope that some day they’d be reunited. 3. The recent increase in the numbers of child migrants is not just a response to gang violence, although this is the most-cited cause in U.S. media coverage. Migration is as much or more a consequence of the increasing economic crisis for rural people in Central America and Mexico, as well as the failure of those economies to produce jobs. People are leaving because they can’t survive where they are. 4. The failure of Central America’s economies is largely due to the North American and Central American Free Trade Agreements. 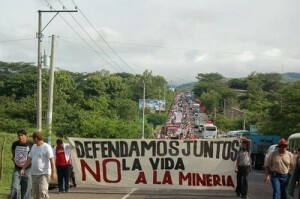 Salvadorans protest the gold mining. …and their accompanying economic changes, including privatization of businesses, the displacement of communities by foreign mining projects and cuts in the social budget. The treaties allowed huge U.S. corporations to dump corn and other agricultural products in Mexico and Central America, forcing rural families off their lands when they could not compete. 5. When governments or people have resisted NAFTA and CAFTA, the United States has threatened reprisal. Right-wing Congressman Tom Tancredo (R-Colo.) put forward a measure to cut off the flow of remittances (money sent back to Salvadoran families from family members working in the U.S.) if the leftwing party, the FMLN, won the 2004 presidential election. His bill did not pass, but the U.S. Embassy in San Salvador admitted that it had intervened. In 2009, the Honduran army overthrew President Manuel Zelaya after he raised the minimum wage, gave subsidies to small farmers, cut interest rates and instituted free education. The Obama administration gave a de facto approval to the coup regime that followed. If social and political change had taken place in Honduras, we would see far fewer Hondurans trying to come to the U.S.
6. Gang violence in Central America has a U.S. origin. Over the past two decades, young people from Central America have arrived in L.A. and big U.S. cities, where many were recruited into gangs, a story eloquently told by photographer Donna DeCesare in the recent book Unsettled/Desasociego: Children in the World of Gangs. The Maratrucha Salvadoreña gang, which today’s newspaper stories hold responsible for the violence driving people from El Salvador, was organized in Los Angeles, not in Central America. U.S. law enforcement and immigration authorities responded to the rise of gang activity here with a huge program of deportations. The U.S. has been deporting approximately 400,000 people per year since 2009. 7. Moreover, U.S. foreign policy in Central America has actively led to the growth of gang violence there. In El Salvador, Guatemala and Honduras, U.S. law enforcement assistance pressured local law enforcement to adopt a mano dura, or hardline, approach to gang members, leading to the incarceration of many young people deported from the U.S. almost as soon as they arrived. Prisons became schools for gang recruitment. Even in El Salvador—where the leftwing FMLN government at least has a commitment to a policy of jobs and economic development to take young people off the street and to provide an alternative to migration—conservative police and military forces continue to support heavy enforcement. In Guatemala and Honduras, the U.S. is supporting very rightwing governments that only use a harsh enforcement approach. Hypocritically, while punishing deportees and condemning migration, these two governments actually use the migration of people to the U.S. as a source of remittances to keep their economies afloat. 8. Kids looking for families here are looking for those who were already displaced by war and economic crisis. The separation of families is a cause of much of the current migration of young people. Young people fleeing the violence are reacting to the consequences of policies for which the U.S. government is largely responsible, in the only way open to them. Two and three years ago we were hearing from the Pew Hispanic Trust and other sources that migration had “leveled off.” No one is bothering to claim that anymore. Migration hasn’t stopped because the forces causing it are more powerful than ever. More enforcement will not deal with the causes of the migration from Central America. In fact, the deportation of more people back to their countries of origin will increase joblessness and economic desperation—the main factors causing people to leave. Violence, which feeds on that desperation, will increase as well. President Obama has proposed raising the enforcement budget by $3.7 billion to address the recent influx of unaccompanied Latin American minors. He has called for suspending a law passed in 2008 that requires minors to be transferred out of detention to centers where they can locate family members to care for them, and to instead deport them more rapidly. Both ideas will cause more pain, violate basic rights and moral principles, and fail completely to stop migration. Yesterday, at the New York Times, Carl Hulse wrote that the law transferring minors out of detention centers “is at the root of the potentially calamitous flow of unaccompanied minors to the nation’s southern border.” This report and others like it not only ignore history and paint a false picture of the reasons for migration, but also provide the rationale for increased enforcement. Similarly, New Jersey Democratic Senator Bob Menendez has declared “we must attack this problem from a foreign policy perspective, a humanitarian perspective, a criminal perspective, immigration perspective, and a national security perspective.” He calls for more funding for the U.S. military’s Southern Command and the State Department’s Central American Security Initiative, among other recommendations. Giving millions of dollars to some of the most violent and rightwing militaries in the Western hemisphere, however, is a step back towards the military intervention policy that set the wave of migration into motion to begin with. Instead, we need to help families reunite, treat immigrants with respect, and change the policies the U.S. has implemented in Central America, Mexico and elsewhere that have led to massive migration. The two most effective measures would be ending the administration’s mass detention and deportation program, and ending the free trade economic and interventionist military policies that are causing such desperation in the countries these children and families are fleeing.